Margaret Blank: Thoughts from a Textile Artist: "Sometimes I sits and thinks..."
"Sometimes I sits and thinks..."
It was hot yesterday, and I found myself between projects...in a manner of speaking. Sometimes, you see, after I've spent several days sampling I find I need a day "off" to let the results of the sampling percolate in my brain. The sensation is similar to that which I feel when I've completed a piece altogether, so I take a break. Yesterday was one of those days. I sats and thoughts -- er, sat and thought most of the day. To keep my hands busy, I pruned an over-zealous ornamental almond shrub at the east side of my garage, and weeded thoroughly around it. I also knit. Pattern: Rhinebeck Hat by Shelia January, knit in Phildar Phil' Laine in "Myrtille" (discontinued) and Sirdar Denim Tweed DK (off-white -- also discontinued). 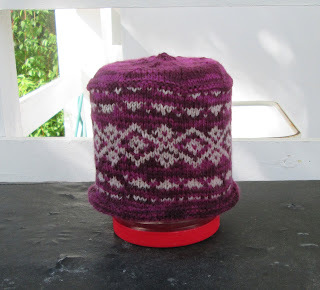 This pattern is published in Clara Parkes' The Knitter's Book of Yarn. 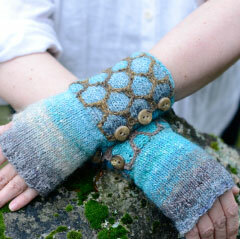 The pattern is Shepherd's Fingerless Mitts from Brenda Dayne's e-book, Welsh for Rainbow. I'm knitting it in Louisa Harding's "Amitola" (Colour #109 - "Salsa"), a wool-silk blend of self-striping yarn with long colour repeats, using the inside of the ball for Colour A (the yellow) and the outside for Colour B (the background which is shading -- for the present -- from green to deep blue and into purple. As the e-book is undergoing constant up-dating, the version of the pattern from which I'm working isn't quite perfect, but I've been able to manage thus far and really love the effect Ms. Dayne has created with the honeycomb look. These will likely be a Christmas gift if all works well. This is "Waiting for the Train", still under construction. I put it away some months ago, having used up the silk ribbon I'd dyed for the bull rushes. I have more ribbon now, but have yet to dye it. I thought it looked too thick and heavy the way I'd added it, and I didn't like the flat, static look of the water (really, just a puddle) in the foreground. I still don't like the water, but I'm having second thoughts about the rushes.... Feedback would be appreciated from those of you who are willing! *either Satchel Paige or A.A. Milne or...? Ah Winnie! Without thinking too much my thought is go with the ribbon but looser. I know they grow thickly but just a few should still convey their presence in the pond. I think that if you put some grasses partly over the water your problem with it will be solved. And yes I agree with Judy, some variation in lenght of the grasses would be better.